There, White said, the pound-and-a-half lobster was destined to be cooked and served to a customer. White said the lobster, which he named Calvin, was caught in Winter Harbor, Maine, and had passed through at least four pairs of hands before arriving in his tank. White sent a picture of the lobster to the aquarium, which agreed to hold the lobster for the Biomes Marine Biology Center in Rhode Island. “Calicos are considered a rare color,’’ said aquarium spokesman Tony LaCasse. 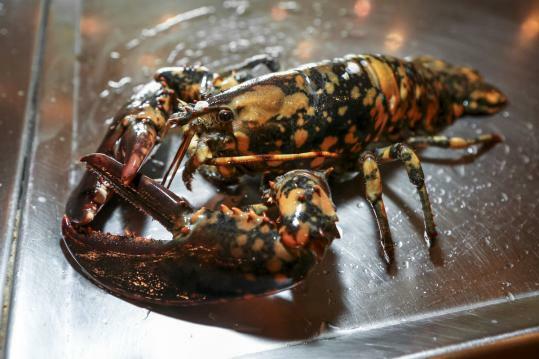 “They used to say 1 in 30 million.’’ LaCasse said an unusual number of calico lobsters were found during the summer of 2009, so scientists are reevaluating that notion. White said Calvin was living comfortably in the restaurant’s tank, where he enjoyed feasting on soft-shell crabs. Coming across the calico lobster marked a first in a culinary career that dates to 1973, White said.